Max Rymsha, from the Ukraine, was one of the winners in the HP Mars Home Planet Rendering Challenge. They won for their piece "Between the Red Mountains" as part of the Rendering challenge. A recent contest challenged participants to create utopian designs of future human Mars settlements, and their creations are stunning. In the HP Mars Home Planet Rendering Challenge, over 87,000 people from all over the world flexed their creative muscles to design the perfect colony on the Red Planet. Last summer, when HP launched the challenge, the participants started working on their designs, and the winners were announced on Aug. 14. 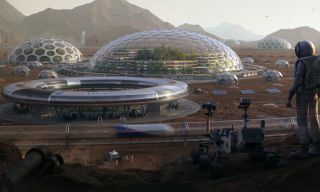 The participants' designs were judged on originality, creativity, rendering quality and Mars physics (or how the design would realistically work on the actual Martian surface), HP included in a statement. The designs must take into account atmospheric conditions, gravity, the soil, the surface terrain, radiation, drinking water, and air, the statement added. Jorge Moreno Fierro, from Colombia, was one of the winners in the HP Mars Home Planet Rendering Challenge. They won "Innovation in Design" for their BIO SYSTEM as part of the Conceptual Design challenge. Rustam Shaikhlislamov, from Russia, was one of the winners in the HP Mars Home Planet Rendering Challenge. They won for their Long Range Universal Platform as part of the MARS Multi-utility Vehicle as part of the 3D Modeling Challenge. Xabier Albizu, from Spain, was one of the winners in the HP Mars Home Planet Rendering Challenge. They won for their MARS Multi-utility Vehicle as part of the Conceptual Design challenge. Bijay Balia Hembram, from India, was one of the winners in the HP Mars Home Planet Rendering Challenge. They won for their piece "Martian Hybrid Power Plant" as part of the Rendering challenge. Bijay Balia Hembram, from India, was one of the winners in the HP Mars Home Planet Rendering Challenge. They won for their piece "Martian Power Generating Machines" as part of the Rendering challenge.